As I made my way along today's Bethpage route, I came up with various titles for this post. 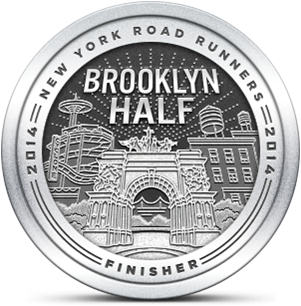 At the two mile mark, it was something like, "Great base run at Bethpage." By the time I'd reached my turnaround point it was, "Oh the humidity!" By the time I reached the end of my run, the above title popped into my head. Today was a base building run to help prepare me for Cow Harbor. With all the focus I've been putting on speed, I didn't want to neglect the fact that the Cow Harbor course is 6.2 miles and hilly. 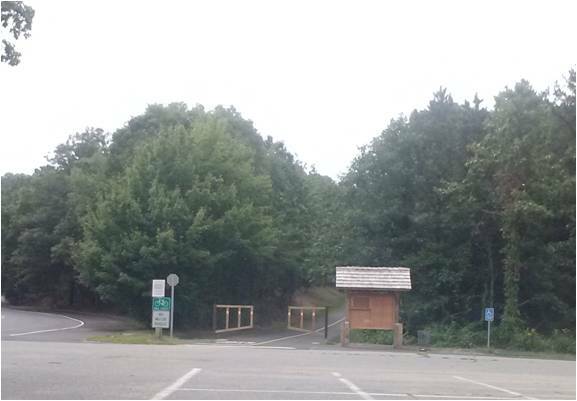 I thought that Bethpage's bike trail would be a great place to duplicate those properties. Cow Harbor's race day weather can be oppressively hot and humid, so today I hit the trifecta for simulating conditions. I didn't plan a particular distance this morning, although I knew I'd run at least six miles. Once I arrived at the park, I decided to run a mile on the north trail before changing directions so I could do the bulk of my distance on the older, somewhat more challenging section. I had little trouble getting through this first part. It was cloudy and 73 degrees, so despite the 89% humidity, it didn't seem so bad. My new-found speed allowed me to pass numerous runners. This was gratifying since I'm often passed by club runners who populate this trail on weekends. My pace for the first couple of miles was on par with what I've been running lately, and I felt encouraged. By the time I reached mile three, I started to feel the effort, especially as I took on a couple of tough hills that come before the Plainview Road roundabout. Despite growing evidence that my smooth base run was about to get rougher, I tried to maintain a brisk pace. The trail between miles three and four trends slightly down, so I was able to keep going without a lot of extra effort. 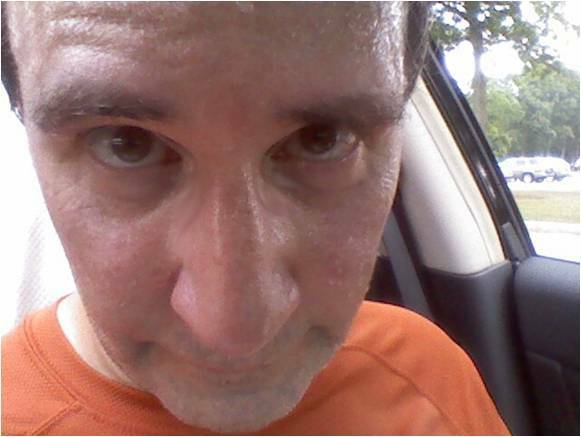 By the time I passed four miles, it became clear that my glycogen level was depleted. I did my best to hold on while my body figured out what to do next. Between a lack of fuel and the overwhelming humidity, I was hurting. Why, after seeing the weather report showing close to 100% humidity today, did I forget to bring a water bottle? My pace had slowed 90 seconds per mile compared to the start, and I switched to a more mechanical stride in an effort to just keep going. I nearly bonked at mile six, but instead slowed my pace even more. I needed to prepare for the dreaded hills that make up most of the last mile leading to the trail head. By the time I reached the biggest and longest hill, I was moving slowly. But I was moving. I even passed a woman on a bike who was struggling to get up the hill. About 4/5ths of the way to the top, my energy began to return and I stepped up my pace enough to put me back into target range. I was thrilled to run the final section of trail leading to the lot. Stopping never felt so good. It was a very tough workout and I'm still feeling the effects seven hours later (although I did participate this afternoon in our family's annual obstacle race - a summer tradition). I don't know if today's experience was due to fitness gaps or if it was more about the weather. Last weekend I ran almost the same distance and performed much better, so it probably had more to do with conditions than conditioning. Next time I'll think about going out so fast on a base run and I'll definitely remember to bring along water. Sounds to me like lack of water and lousy conditions. It was really brutal out there today despite overcast conditions. I just re-ordered electrolyte tabs for my water. Especially in the warmer weather, I don't drink plain water anymore. What did you eat before the run? I agree that it was primarily about the weather, but I didn't help myself by pushing so hard. I've had mixed success with Nuun electrolyte tabs and terrible experiences with some other types. When I used to regularly carry hydration, it was often Gatorade G2. Overall, I do best with plain water supplemented with GU Roctane. Before yesterday's run, I'd had a Cliff bar about two hours prior and a square of Ghirardelli 72% chocolate about 30 mins before the run. I just ordered the Nuun yesterday because they were cheaper than the Endurolytes. Yesterday was the first time my face was left with a salt residue.. so I'm glad I had the electrolytes with me, even though I ran out of hydration. I think my sis uses the roctane. I'll have to check that out, thanks! I believe that if the weather had cooperated, you would have rocked that run. How could you have not with all this great times you're producing lately? I'm fine with how it went yesterday because I gave it my best. One thing I've learned is that one race or workout doesn't define your capabilities. Let me know how you like the Nuuns. Sounds like a tough run. Way to gut it out. I tried to practice recovering while still running today. I had decided to do some intervals of some type, and normally when I do I alternate running and walking to recover. Tonight I alternated running intervals at a 9:50 pace with recovering at a 12:00 pace. Not sure it's helpful, I guess I'll have to see. Intervals will certainly help your speed and will also build up your stamina. What you're doing is training your body to use anaerobic energy more efficiently. That will allow you push harder throughout a longer run. Next time you run intervals, you might want to alternate fast runs of 100-200 meters with 30 seconds to one minute's rest. Save the recovery running until the end of the workout.